← Kaiju Negora Meow ! 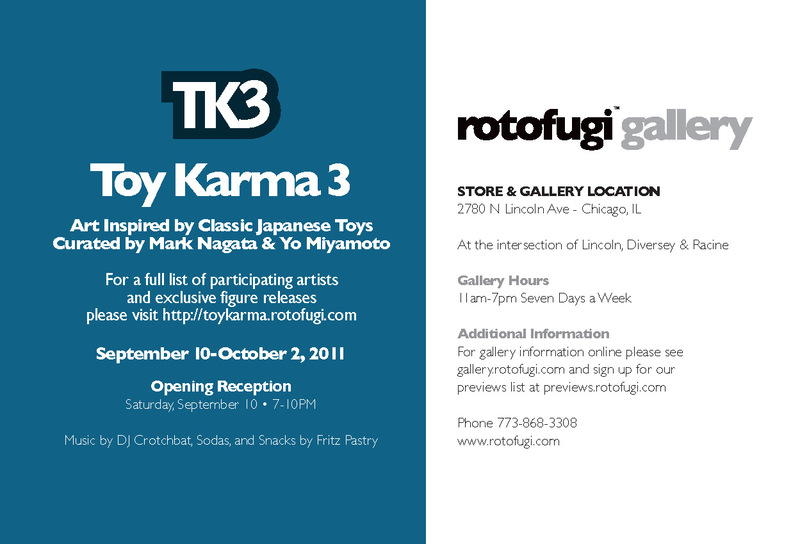 Max Toy / Mark Nagata Updates Toy Karma 3 !!! 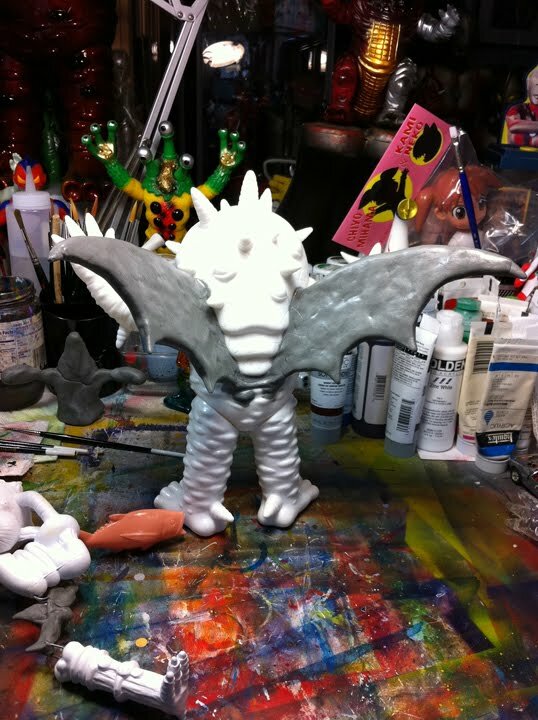 Here’s a quick step by step of one of the custom pieces i did for the Toy Karma show .. a Winged Kaiju Eyezon ! Basically this is a big sized version of the Neo Eyezon. 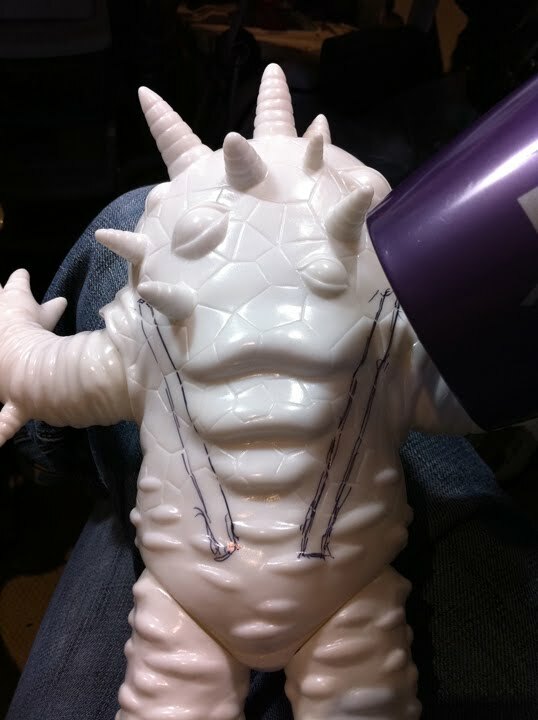 Using that as a guide i cut out the wings from foam core and traced where they would be o the back of the Eyezon. Once i had the pattern i heat up the back and using a sharp xacto blade cut slots into the back. I placed each foam core wing in the slots and glued them with epoxy glue. 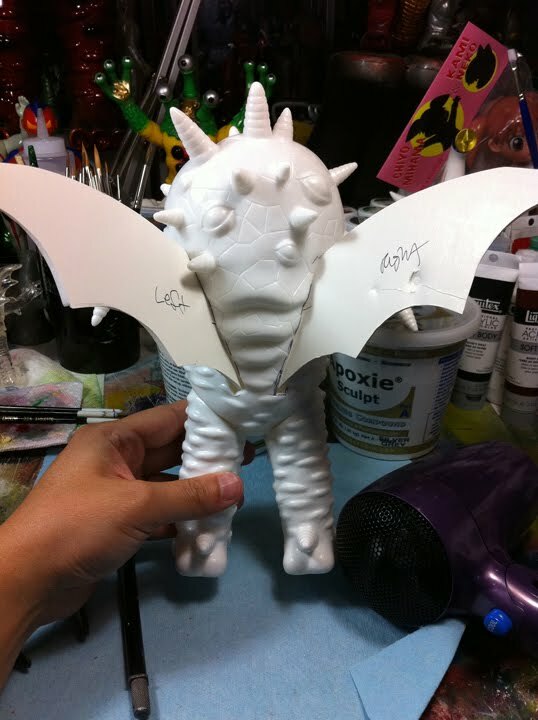 Once dry I mixed up some Aves Apoxie Sculpt and started covering the wings. 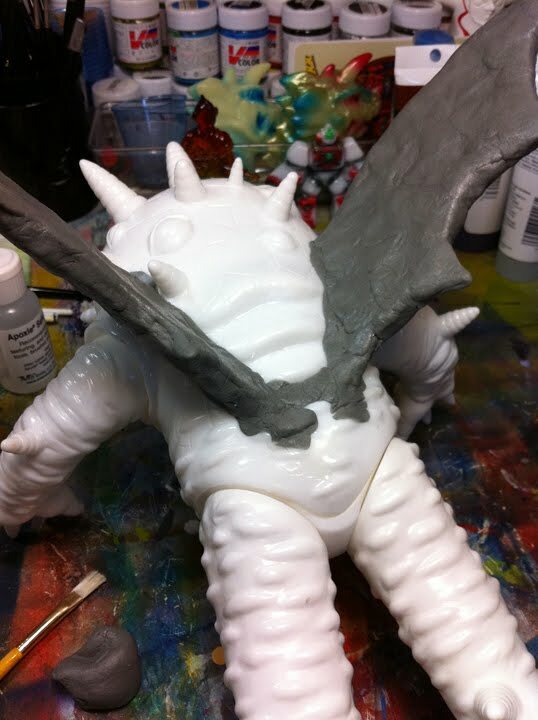 The first layer would be to cover the foam core and to add strength to where they meet the back of the figure. adding some ropey veins .. and despite using foam core the wings were too heavy for the figure to stand .. so i filled the legs with more apoxie sculpt. But in the end the figure needs to be slightly tilted forward while he stands to counter balance the weight of the wings. after some minor sanding and drying overnight the figure was ready to be painted. 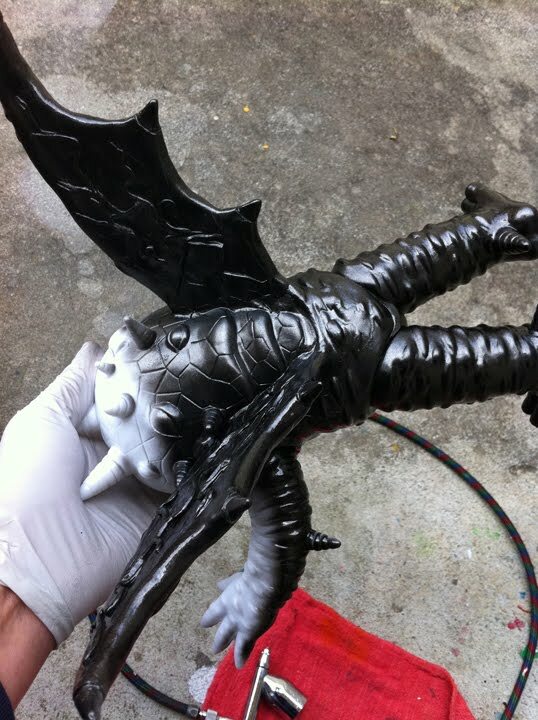 Having worked off a white based figure i needed to base coat the figure with Monster Kolor black paint. 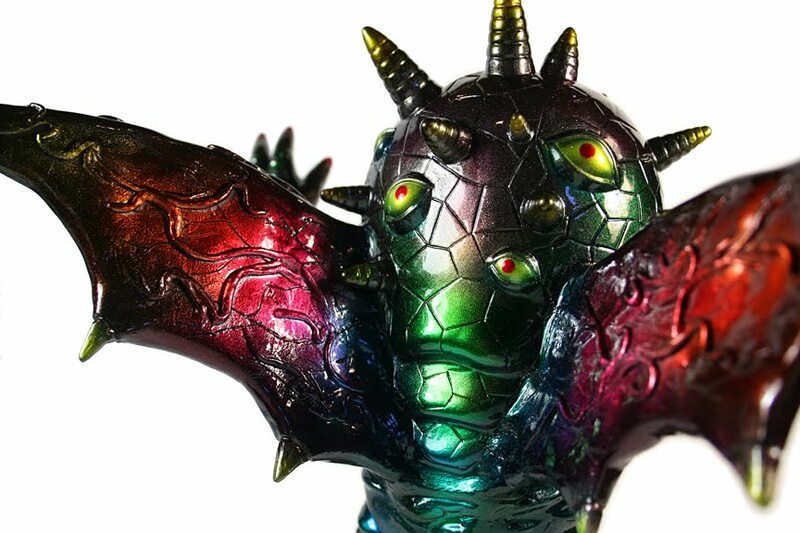 and finally color change and a final coating of gloss coat to seal in the paint plus bring out all the glittery effects. 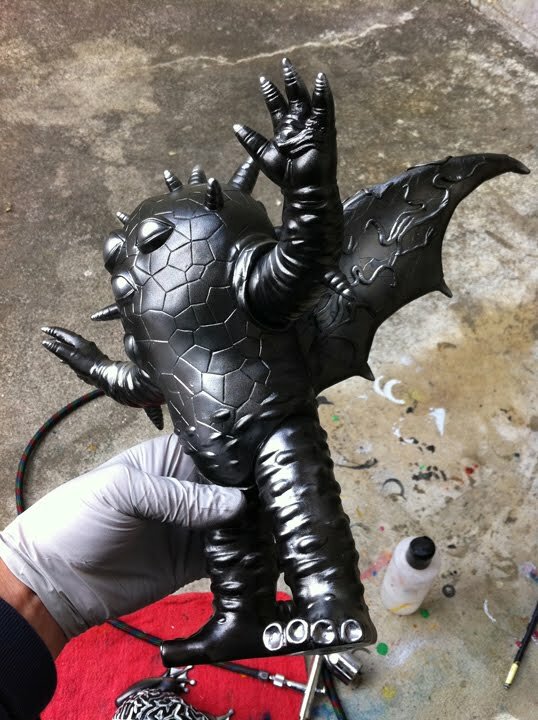 and even though this is not me spray coating this particular figure ( its the Kaiju Dualos ) it is the same process of spraying down the figure. 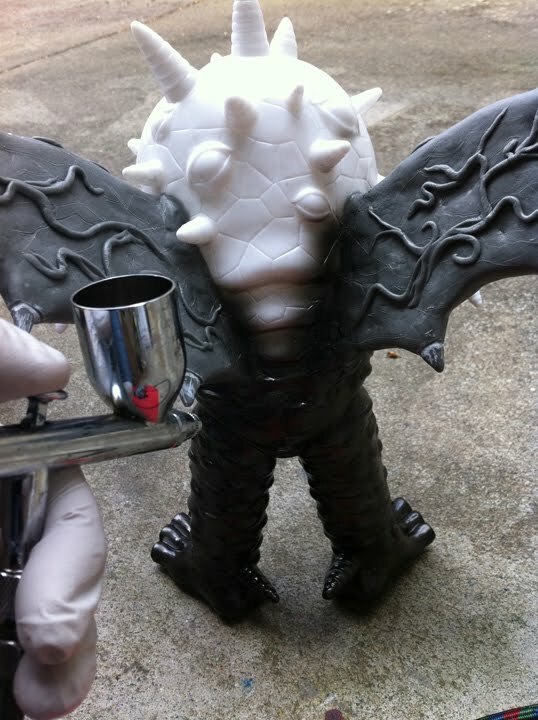 This figure and much more from many talented artists will be for sale at Rotofugi Gallery on Sept 10th, 2011. I’ll be traveling to Chicago so hope to see you all there !